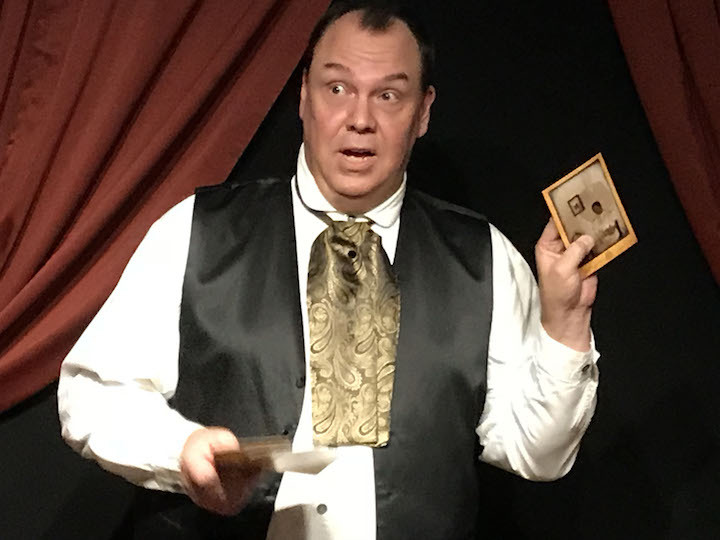 I have finished my run of shows at The Secret Parlor Theatre in Chantilly. The Secret Parlor Theatre is now gone, vanished into the night. That was the plan all along. It was an experiment and was not planned to run more than the month. Will the SPT ever appear again? I'd say the chances are quite good, but in a different location(s). 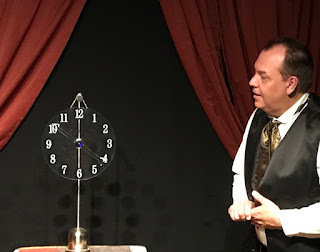 The straight magic from the show included: Hofzinser's Everywhere & Nowhere, A Surprising Rope Mystery, and a Classic Ring in Nest of Boxes. There were other pieces, but those were the main ones. The seance part of my program begins with my Spirit Photo routine, which is so much fun to do. The Spirit Dial, which is shown at the top of the page is presented during the seance portion, and it concludes with the Spirit Horn. Missing from the seance was the new slate routine, and one other routine that I'm forgetting at the moment. Because this was the smaller seance, it does not include the Spirit Cabinet. The Astonify Show is a work in progress. I wanted it to be a smaller venue show, but it seems that it will be growing in size very quickly. I plan to add a couple true Victorian routines to the show, and then some adaptations of modern routines. Kind of like when I steampunked some props in my other show. I'll Victorianize props, lol. to make them work in this show. Then of course, there is another option and that is recreating actual forgotten Victorian era magic. And I have two routines in mind, the bad part, no one knows how they're done today (thus the forgotten part). One routine, The Devils Cage, is a routine I've had my heart set on for a long time. I sense it's in my very near future. I continue to write routines for the show, so expect amazing things to debut in next years version of the show!